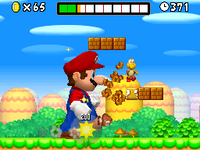 World 1 is the first world in New Super Mario Bros.. 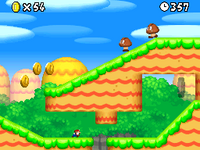 It is a grassland-themed world with enemies such as Goombas, Koopa Troopas, and Cheep-Cheeps. 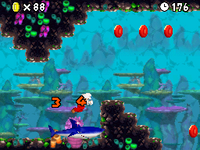 This world also introduces the game's new power-ups, the Mega Mushroom, Mini Mushroom, and Blue Shell. 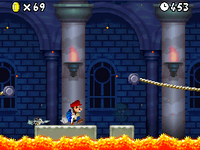 Bowser Jr. and Bowser are fought here at the Fortress and the castle respectively. 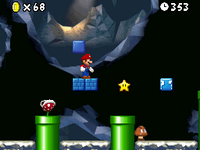 There are eight levels in the world, with four along the standard path, one along a split path, and the Castle/Fortress level. There are five Toad Houses: two power-up houses, one Mega Mushroom house, and two life houses. 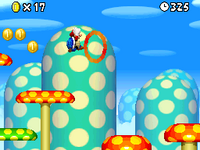 In addition, when the player beats the game, another blue Toad House appears, in which the player can buy and swap wallpapers for the touch screen while on the World Map. 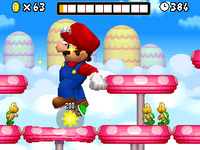 World 1 also appears as a background for Dream Figure Skating in Mario & Sonic at the Olympic Winter Games. 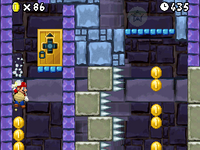 World 1- Cannon This area can be unlocked by using the secret exit in World 1- Tower. The area contains a cannon in the middle of the grassland. 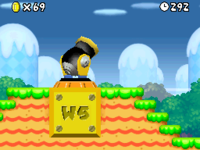 If the player enters the cannon, he or she will be launched to World 5, which can be seen in the background. Click a level icon to open the relevant article. This page was last edited on November 24, 2018, at 06:56.